I found the recipe for these cookies, called Happy Hippie Cookies, by Ashley Swider of YesUmay Cookies in Yoga International in an article by Kathryn Budig. I loved the list of ingredients, so I decided to try them. The batter turned green! I assumed it was oxidation, or something, and it tasted good, so I baked them anyway. 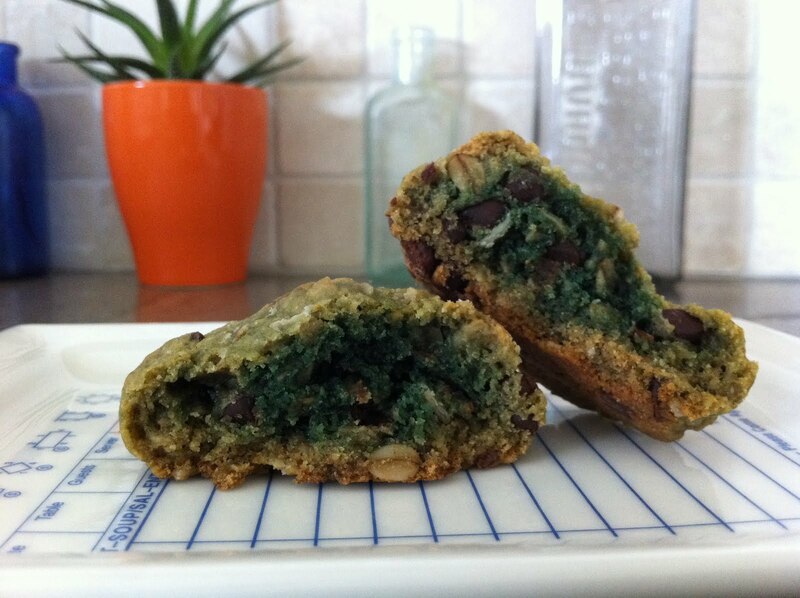 The outside looks like regular cookies but the inside is green, bright green! We ate them all AND we renamed them: Green Power! I will try again, but I am not completely convinced it is the baking soda/banana combo because I use that in both my chocolate cookies and banana bread and they don’t turn green. But, really, who cares! They are fun and delicious! In a mixing bowl, combine the sunflower butter, coconut oil, bananas, sugar and vanilla using a hand mixer. Make sure it is nice and smooth. Then add the flour, oats, baking soda, and salt. Mix again to combine. Then mix the chips in. Refrigerate for 30 minutes. Preheat the oven to 325. Line a baking sheet with parchment paper. Using a three tablespoon ice cream scooper, place the batter on the paper evenly. The recipe should yield around 2 dozen good size cookies. Bake for 15 minutes. Enjoy the green power!